For much of the 2018 college football season, the sports world was stuck hoping and wondering if there was any way Oklahoma’s 5-foot-10 quarterbacking phenom and eventual Heisman winner, would forgo his professional baseball contract to pursue a career on the gridiron. 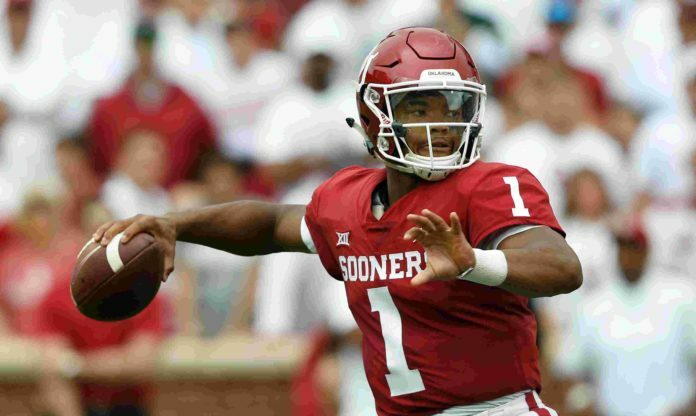 Their prayers may have been answered, with Kyler Murray officially declaring for the NFL Draft on Monday. Murray‘s decision is good news for the Broncos, who were likely about to dive head first into this shallow pool of quarterback prospects. Thanks to Murray, that kiddie pool is now slightly deeper. Ever since Peyton Manning‘s retirement, the Broncos have been searching for the next guy to take the reigns at quarterback. Unfortunately for Denver, even after drafting multiple quarterbacks and testing the free agent waters, the Broncos are still in a position where they need to find the next quarterback of the future. First, seventh-round pick Trevor Siemian and Paxton Lynch washed out, now, it appears the Broncos have decided 2018 free agency acquisition Case Keenum isn’t the guy either, as Rich Kurtzman addressed earlier. The Broncos have been very active in regards to the 2019 quarterback prospects, but does Murray’s declaration shakes things up for the orange and blue? 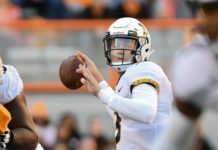 John Elway has already been linked to Missouri quarterback Drew Lock. The connection to Lock won’t surprise many Broncos fans. He stands at 6-foot-4, weighs 225 pounds, and has an arm that could throw a football all the way to Colorado. In other words, he is Elway’s type. Murray is not. Murray might be able to reach his official school listing of 5-foot-10, but most scouts think he is closer to 5-foot-9, and only weighs 195 lbs. The only other successful NFL quarterback near that size is Russell Wilson, who measured 5-foot-11 and 204 lbs at the combine. That being said, what Murray lacks in size, he more than makes up for with raw athleticism. Running quarterbacks are nothing new to the NFL. From Michael Vick in 2001 to Cam Newton in 2011, and even Lamar Jackson in 2018, there are plenty of examples of successful athletic quarterbacks in the league. 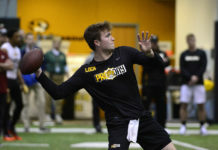 While Murray relies on his legs though, NFL draft analyst Daniel Jeremiah indicated that the young QB may actually be a better thrower of the football than any of the quarterbacks listed above. Although Murray lacks the Drew Brees-esque level of accuracy, he is a very polished passer. Murray has a live arm that can get the ball wherever it needs to go, and he’s much more accurate than Drew Lock. Outside of his size, the only major concern for scouts is the way Murray loves to improvise. Murray plays very reminiscent of a Brett Favre or Patrick Mahomes. His play can be chaotic and often even looks like schoolyard football, but, just like Mahomes and Favre, it works for Murray. Considering Lock is likely Denver’s only other realistic quarterback option with the tenth pick this April, if I were John Elway, I would be pushing all my chips in on Murray. This is for two major reasons. First, Kyler Murray is far more accurate than Lock, which is arguably the most important trait for a quarterback prospect. Murray also has a more fluid throwing motion and doesn’t struggle with the mechanical problems that plague Lock. Second, after seeing Denver’s offense stuck in a state of malaise for the past four seasons, Murray could provide the spark that the Broncos need. 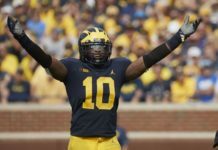 Broncos fans are ready for some excitement, and while taking Murray would certainly be a risk, no offensive player in this year’s draft is near as electric or as exciting as No. 1. His height is somewhat concerning, but considering it’s his only real downfall, the strengths clearly outnumber the weaknesses. The Broncos already learned that height isn’t everything when the Broncos passed on Russell Wilson when he came out of Wisconsin. Think Seattle was worried about his height when Wilson led them to two Super Bowl appearances in three years? Doubtful.